Last time I wrote about German Sparkling wines aka ‘Sekt’, and if it did not come across clearly, I really, really like Sekt. So many Sekts give Champagne, Cava, or Crémants a good run for their money, and it is a category of German wines that should get much more attention than it currently does. So you’ll understand my excitement when Weingut Braunewell got me an invitation to attend the Sparkling Festival 2018 in Frankfurt – and you’ll understand my disappointment when I realised I would only have a short amount of time to attend the Sunday event. Being a responsible dad and family man takes its toll. 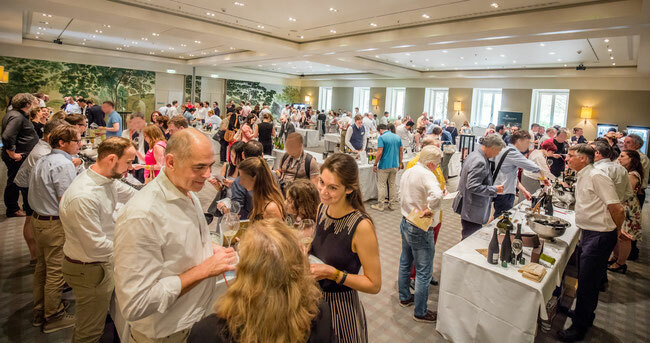 Even though it was only in its second year, the one-afternoon tasting event at the grand building of Villa Kennedy in Frankfurt seemed to have very good traction with winemakers, trade, and aficionados. 54 producers from 10 countries were represented: Germany of course, the usual suspects such as France, Italy and Spain, but also newcomers like England and Slovenia. Each exhibitor brought 3-4 varieties of their bubblies to taste. Good for me: Close to half of the represented estates were German. Not only the elite German Sparkling houses—Raumland from the wine region of Rheinhessen, von Buhl and Menger-Krug both from Pfalz—attended, but there were also some very interesting young and dynamic ‘newcomers’ like Griesel & Compagnie from the Hessische Bergstrasse, Sekthaus Krack from Pfalz, and Braunewell out of Rheinhessen. It’s hard to say how many people were in attendance, but when I left - much too early, but well into the event – there was a solid crowd. Last year there were 250, per the organiser*. But that’s just figures…. 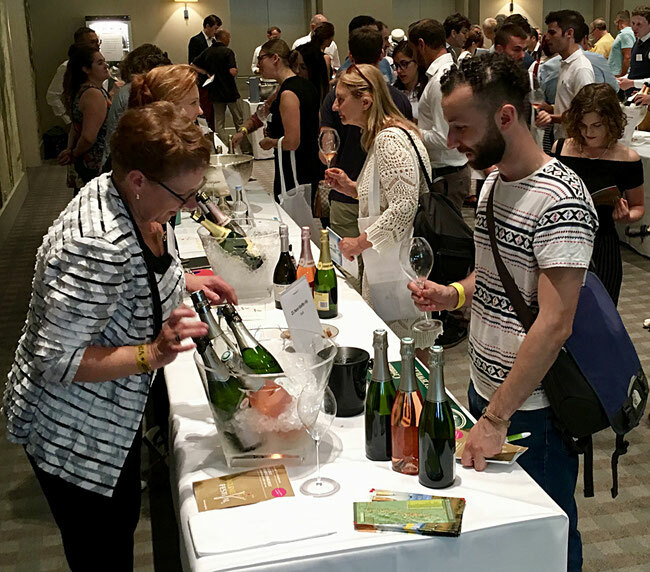 Essentially at no point did the room feel packed, so tasting was a relaxed affair, and, even more importantly, there was always a chance to have a chat with the winemakers who, in most cases, presented their wines personally. Due to my time limitations I had to narrow my picks and dropped by the tasting tables of Sektgut Bamberger, Schlossgut Diel, Griesel, Krack, Weinreich, Solter, von Buhl. In a nutshell: all of the Sekts poured were clearly the result of extreme dedication and passion for the craft – great sparkling wines altogether! It seems that the Pet Nat movement is phasing out. The only bottle I found was “Perlen vor die Säue 2016” from Weinhaus Weinreich – a properly disgorged and well-domesticated representative of Pet Nat. There also seems to be a general agreement about an extended time on the lees with 20 months being a minimum. The entire range of Sekthaus Krack’s quite affordable and very enjoyable selection of Sekts spent at least 24 months on the lees. The Cuvee MO 2008 from Schlossgut Diel stood out with 92 Months on the lees. Finally, Extra-Brut and Brut Nature seem to be the leading style. Even though off-dry Kabinetts are very much in fashion for still wines, in Sekts sweetness takes the opposite direction with dosages typically far below 6g/L (the average Brut Champagne is 6-12 g/L). Just one exception stood out: Wein- und Sektgut Bamberger’s 2015 Gewürztraminer Halbtrocken (off-sweet) which was to me a very enjoyable representative of its kind. And Sekthaus Krack scored with its range of very affordable Sekts with funky labeling. The 2015 Riesling Brut, 2015 Pinot, and the 2014 Freundeskreis (Pinot Noir and Chardonnay) were all extremely pleasant yet very inexpensive at 12-20 Euro per bottle! So ends my review of the Sparkling Festival 2018. A bit abrupt, innit? Did I mention that I had too little time there...? Now, though, I am waiting for the release of the date for the 2019 festival (June it will be), so I can make sure to have the full day entirely dedicated to tasting all that wonderful fizz. Many thanks to Stefan of Weingut Braunewell for the invite!